Last night the babies slept for seven straight hours! This was an amazing feat which should have resulted in a great night of sleep for the whole family! Unfortunately our upstairs neighbors decided that starting at 3:00 AM they were going to begin a shouting match that went on-and-off until 7:00 AM. I don't know what they were arguing about as the argument did not take place in English but one thing cannot be argued: they are jerks. This week I spent this week in San Francisco on a work trip. While it was nice getting a full night of uninterrupted sleep I did miss Jen and the Wombats pretty badly. 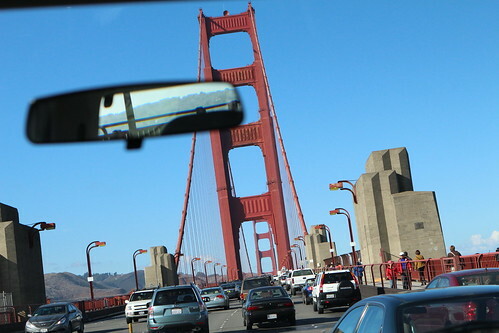 One good thing about visiting San Francisco if you live in New York is that you get the opportunity to be constantly reminded of home by being stuck in traffic on bridges. It's just that the bridges are different so it keeps things fresh. 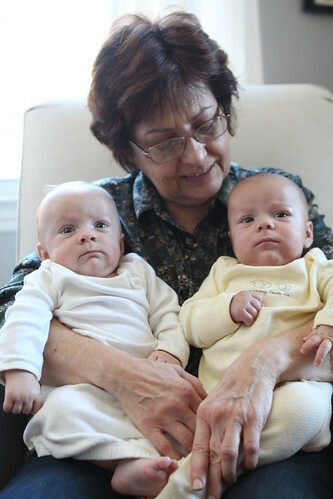 While I was away Grandma came and watched after the Wombats while Jen was at work. She took advantage of this time by sending me constant updates of what the babies were up to. Mostly they were giggling, sitting in their Bumbos, and bonking each other on the head with their poorly controlled fists. Jen picked up our last Thursday farm share pick up of the year while I was out of town. 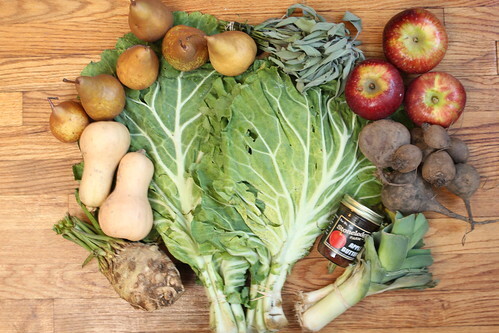 This week we got two tiny butternut squash, a bunch of leeks, beets, sage, celeriac, black radishes, apples, pears, and a jar of apple butter. We also got what they said was kale but looks almost exactly like collard greens. Jen opted not to pick up the cabbage and took another bunch of the kale. This was for two reasons: one we are pretty sick of cabbage and, two, it gives the Wombats tremendous amounts of gas. We had a nice Saturday afternoon visit after a trip to the local school's bake sale and barbecue. Heather, Adam, and Anne came to visit the babies in a more controlled environment after the guys ruined Heather and Adam's wedding last month. They were able to repay the favor by snuggling and feeding them. Finally they were able to enact their harsh and exacting justice on the Wombats. For dinner I cooked up some of the farm potatoes and celeriac which I mashed together with butter, salt, pepper, and sour cream since we were out of milk. I also roasted some of the farm Delicata squash and apples together with farm sage. I also rendered a little bacon, caramelized some of the farm leeks, threw in the farm kale, and cooked it all down with a touch of cider vinegar. 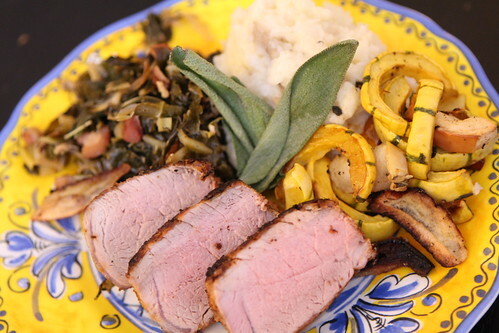 To accompany all this I pan roasted a duBretton pork tenderloin which I seared with a dry rub and sliced into thick medallions. I had one non-work related mission in San Francisco: get some beer from Russian River Brewing Company. 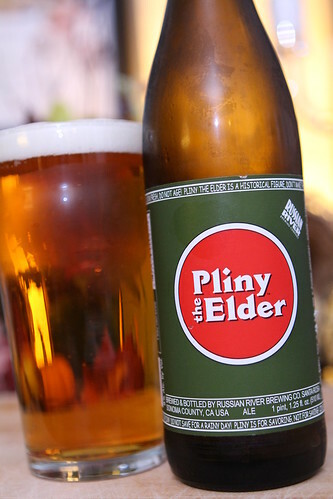 On the second day, after striking out at several locations, I was able to find not only a beer from Russian River but the beer from Russian River: Pliny the Elder! 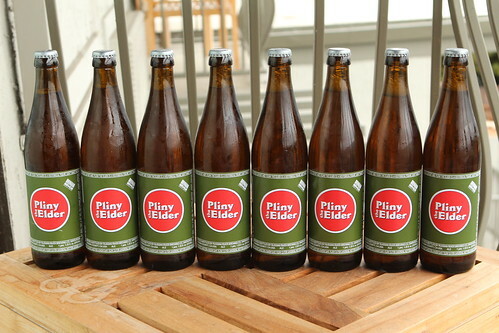 For those of you unfamiliar with the lore of Pliny it is considered by many to be the best beer in the world right now. It is also warned on the label to be consumed fresh. This was bottled on October 4th and I consumed it originally seven days later on October 11th. Was it good? Extremely. Was it the best beer I've ever had? Probably not but it was definitely in the top ten or so. I think it would be hard for any beer to live up to the hype surrounding this beer. Like I always do when I find a rare beer I overreacted and purchased every bottle they had in the store. I shared four of the bottles with coworkers then decided to risk the journey home, packing up the remaining four in dirty socks and paper bags. Miraculously they all survived and we were able to have two more with dinner last night, a mere nine days after bottling. Jen also enjoyed the beer quite a bit. It was a nice treat. Who knows when we'll ever get a chance to have a bottle of this again? So it was that we broke with our pumpkin theme as I was too terrified to ignore the warning on the label of the Pliny to drink it fresh. Pumpkin/seasonal beer tasting will resume promptly next week. More vegetables to be picked up tomorrow so I will need to kick it into overdrive to use up everything we have. The farm share is nearly done for the year but this may take a little pressure off as we race toward winter. Cooking time is at a premium these days. Pretty soon this blog will simply be about beer and babies and I will simply not bother mentioning the dry pasta I make for dinner on a nightly basis. Beer and babies. What else is there that's really worth mentioning anyway? 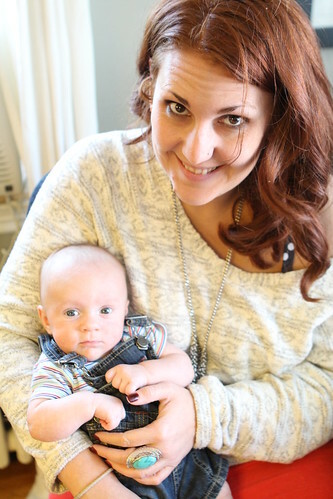 Labels: babies, beer, Dinner Guests, How'd we use it?, Travel, What'd we get?